The Villa Amalfi resembles a Mediterranean inspired village. Just 48 paired villas (total of 96 owners), make this a quaint neighborhood that offers a lovely pool pavilion area for family and friends to enjoy. These original owners chose this particular address, because it provides the longest paver driveway in the community, allowing plenty of parking for friends and family visits. The long list of upgrades helps create the contemporary ambiance in this light and bright villa home. Favorite kitchen appliance selections, white cabinets with maple interior, dovetailed soft touch drawers, as well as the large washer and dryer, are among the many selected upgrades. The quartz kitchen and bath countertops are a preferred choice among designers. Recessed lighting, great room coffered ceiling, and gorgeous large plank wood floors run throughout. Plank "wood look" tile flooring in bathrooms and laundry room. The extended lanai has paver flooring to add to the relaxing outdoor atmosphere. 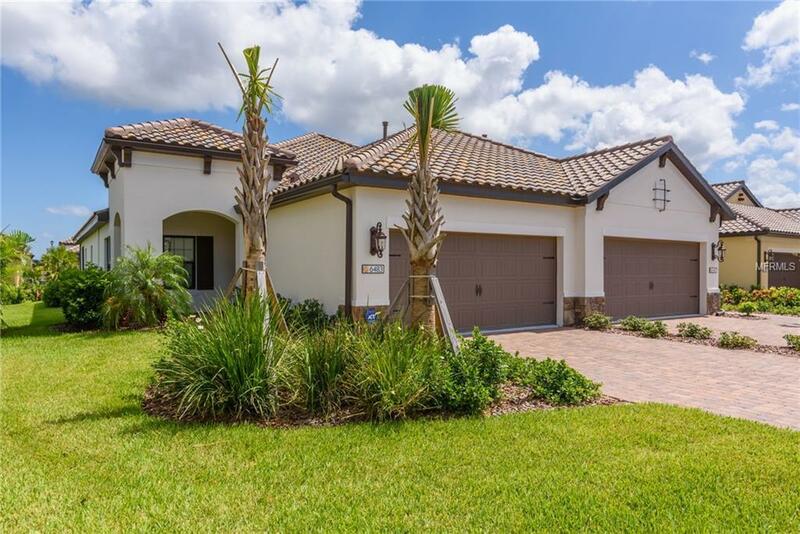 Villa Amalfi location is just minutes from some of Sarasota's finest shopping destinations, including the University Town Center Mall, cultural venues, restaurants and the Sarasota-Bradenton Airport. This Villa's vibe is modern and comfortable, in a gated, maintenance free community.